Fishballs might be one of the most common street food across Asian countries but in the Philippines its quite different as it is a low cost rendition of the Asian fish balls hence it does not retain a ball shape once it is served and deflates easily after cooking. It is also served with a choice of four different sauces, a sweet soy sauce based garlic infused sweet gravy (spicy hot and regular) as well as sweet spice infused vinegars (spicy hot and regular). Sold in wooden carts equipped with a large wok for deep frying pushed by Manong’s (a term used to call an elderly man as a sign of respect) in street villages or stationary in some densely populated alleys every afternoon. These carts are a common sight and like I said it is equipped for deep frying and a sauce station, in this cart other varieties of deep fried street food are offers such as kikiam and squid balls. In the Philippines everyone will have their favourite Manong and if you are a “suki” (regular customer) then you will be given a schedule on which day and what time the Manong would visit your place. When I was in the university my house was barely a kilometre away from the gates of where I studied so it became our “tambayan” (hangout) every afternoon. My friends as well as some of my close classmates stay there almost every day and my place was also the favourite hangout of our village Manong, he usually visits our place on weekdays at exactly 4:30 PM and he does not miss this schedule as he usually sells out everything in front of my house. Neighbours have little chance of having him so most of them go to the front of my driveway to have a doze of this addictive deep fried street food. Every day he tells us his life stories and experiences while he cooks with his signature oil infused with “bawang” (garlic), he also keeps fresh bottles of sauces for us so we are not paranoid in contracting a disease called Hepatits which is common with street food, this is why we love our Manong he keeps special attention to our needs. His daily stint usually lasts for an hour, that’s more than enough to cater for at least 8-10 hungry university students a day. Now you might be wondering, if were university students how do we afford to have this almost every day? Well fishballs are really cheap back home, during those days it was PHP 0.10 (US$ 0.002) a piece for fishballs, PHP 0.25 (US$ 0.005) a piece of squid ball as well as the kikiam. How about you what was your favourite snack back in the college days? Do you have a favourite street vendor? In a saucepan combine all manong's sauce ingredients, mix well until free of lumps. Place in stove top then cook by gently simmering in medium low heat until sauce thickens. Deep fry fishballs according to your liking, if using the Philippine fishballs fry them until they are really crispy. Loved the history of this and your snacks during your college days. In the UK we did not have such foods, the nearest we had to snacks were sweets, usually from the newsagents. However, an old couple just a few hundred yards from my school converted part of their home into a tuck shop where we would all queue for sweets and ice lollies etc. I would have preferred to have snacks such as Phillipines, China etc etc, but that’s different cultures for you I suppose! I must try this recipe soon, not a big fish fan, but the sauce is very enticing. I’m loving your street food series. I seriously got a feel for what it was like for you at University for a bit. The different sauces sound divine. What a great recipe for fish! This sauce looks incredibly good. Fun dish — thanks. Yum! 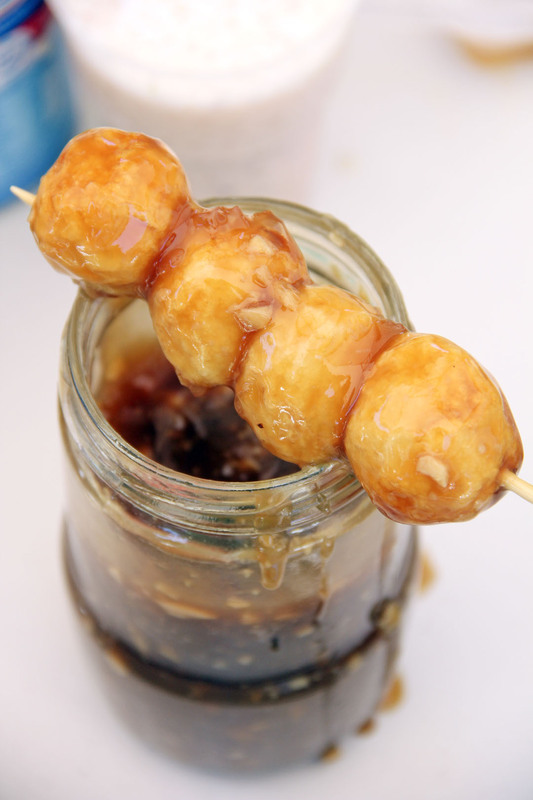 I like the idea of deep frying the fish balls and yes, the sauce is just a perfect with the fish balls…look delicious! Oh, what great looking bites! I remember this too. I was going to Cebu and we also this kind of cart and we dip the fish balls in the sauces. So delicious. I love the sauce here and the picture captured how I remembered those fish balls look like… delicious! I don’t know why fish balls are so popular in Asia and not elsewhere. When I was in Taiwan, I had plenty of fish ball dishes (in soup or in skewers) and I especially love squid one. Ohhh so good. I’m curious about this sauce! 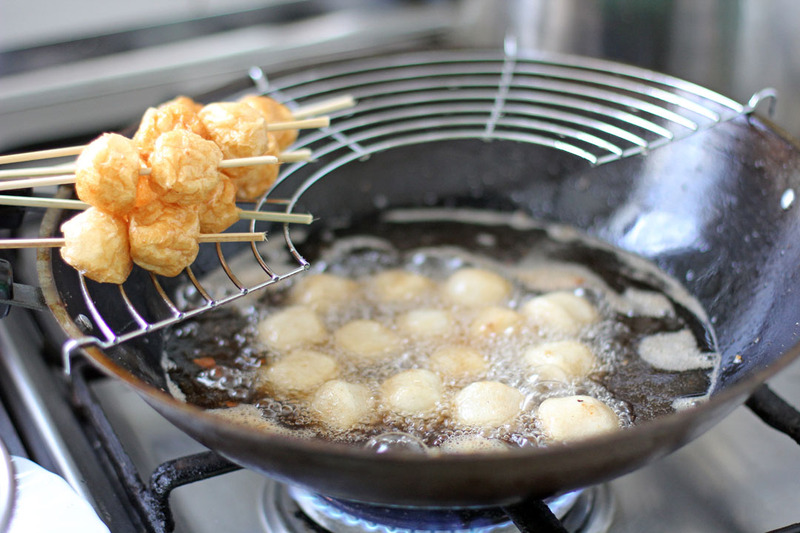 o ……I like the idea of deep frying the fish balls, the sauce is just a perfect with the fish balls… for delicious idea…! It’s all about the sauce ! mas lalo kayong gaganahan pag natikman ninyo ang fishballs ng malolos crossing..